Jack and Troy from ZiaComics.com get all nerdy about the hints dropped about Deathstroke. The character is likely to appear in an upcoming DC Comics related big screen movie. The movie(s) he will likely appear in is the upcoming Batman movie or Justice League. Deathstroke is a very deadly character with a somewhat tragic backstory. The Arrow TV series touched on the character a bit, but never fully fleshed out Deathstroke. Slade Wilson was sixteen years old when he first enlisted in the United States Army, having lied about his age. In the early 1960s, he met Captain Adeline Kane. Adeline was training young soldiers in new fighting techniques. Kane was amazed at how skilled Slade was in all fighting techniques. Slade quickly he adapted to modern conventions of warfare. Adeline immediately fell in love with him. She had never encountered a more able-bodied combatant. She offered to privately train Slade in guerrilla warfare.In less than a year Slade mastered every fighting form presented to him. Six months later he married Adeline and she became pregnant with their first child. Slade was reassigned to Vietnam. In the war his unit massacred a village, an event which sickened him. SAS member Wintergreen rescued Slade in Vietnam. The United States Army chose Slade for a secret experiment. The Army imbued him with enhanced physical powers in an attempt to create meta human super soldiers for the U.S. military. 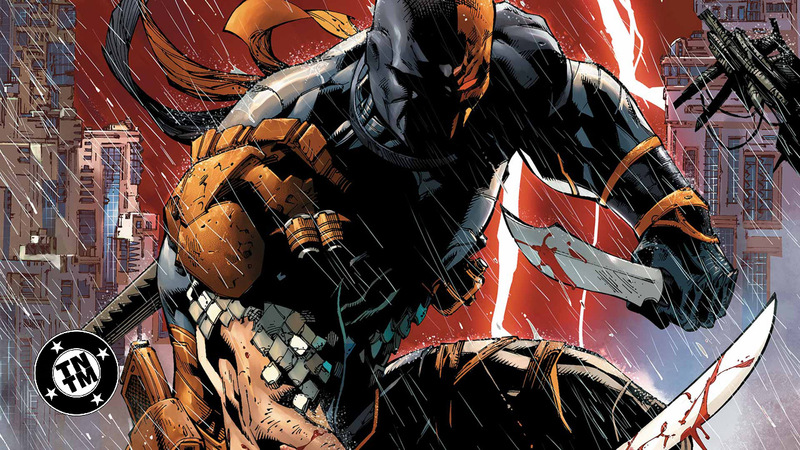 Deathstroke became a mercenary soon after the experiment when he defied orders and rescued his friend Wintergreen. A commanding officer with a grudge sent Wintergreen on a suicide mission. A criminal named the Jackal took his younger son Joseph Wilson hostage to force Slade to divulge the name of a client who had hired him as an assassin. Slade refused claiming it was against his personal honor code. He attacked and killed the kidnappers at the rendezvous. One of the kidnappers slashed Joseph’s throat before Slade could prevent it. This destroyed Joseph’s vocal cords rendering him mute. Adeline became enraged at his endangerment of their son. She tried to kill him by shooting him. She only managed to destroy his right eye. His confidence in his physical abilities was such that he made no secret of his impaired vision. He marked this with his mask which has a black, featureless half covering his lost eye. Without his mask, Slade wears an eye-patch.